IREM Leasing books, courses, forms, and webinars will help you expand your skill set and provide resources for every step of your career development. No matter your level of experience and expertise. There is never a dull moment in the life of a residential manager. From hiring new employees and balancing the budget, to overseeing construction projects and keeping the apartments leased, every day brings a new challenge and a problem to solve. There is no doubt that residential management is a complex and rewarding field. 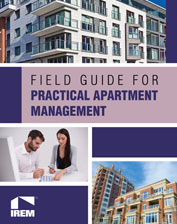 The Field Guide for Practical Apartment Management provides managers with the tools and expertise necessary to professionally manage the day-to-day aspects of residential properties. It is a comprehensive guide book that will serve as an ongoing reference tool, and provides many forms and checklists for immediate, on-the-job application. The Field Guide is organized into four parts that cover all aspects of managing multifamily properties. Part 1: Human Resources and Relationship Management—putting the team together and managing those responsible for the property’s success. Part 2: Finance—introducing the accounting and budgeting skills needed to meet the owner’s goals and objectives and providing a foundation for making day-to-day operating decisions. Part 3: Maintenance and Risk Management—reviewing maintenance and risk management plans, as well as the tools and techniques for conducting inspections to protect residents, guests, and the owner’s asset. Part 4: Marketing and Leasing—identifying appropriate marketing and leasing strategies and practices to find and retain residents. The Field Guide for Practical Apartment Management is a comprehensive guide to apartment management, drawing upon the knowledge and experience of over a dozen recognized experts in the field. The Field Guide is a must-read for everyone who manages apartments, whether they are new to the industry or seasoned veterans. Accurate and efficient lease administration is an important component of every building’s tenant relations program. But when leases are poorly administered, the property can be robbed of some of its cash flow and value through inaccurate billings. In addition, property operations can be negatively affected with poor lease administration and tenants can lose trust in the landlord and the property manager. 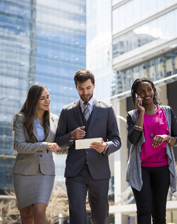 How positive relationships with tenants make lease administration easier. How to abstract a lease and who is qualified to do it. How property managers must understand the commercial lease and how the different provisions affect the landlord’s investment, the property and the tenant’s right to operate a business on its premises. How to calculate pass-through charges for retail, office buildings and industrial properties. 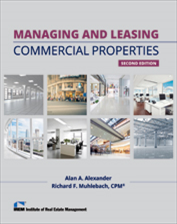 The newly revised, second edition of Managing and Leasing Commercial Properties is the essential resource for every manager of any type of commercial property. No other publication covers the entire spectrum of the business of managing and leasing commercial properties. Encompassing property types from office and industrial buildings to shopping centers and medical buildings, this book is a hands-on guide that provides problem-solving methods, procedures, tactics, and tips for all commercial property managers. When it comes to apartments, positioning your property in the market and attracting and retaining new residents are essential for your success as a property manager. 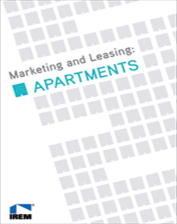 Marketing and Leasing: Apartments is a resource for learning the key strategies for reaching qualified prospects, selling your property’s benefits, and successfully closing on the lease. A real estate manager’s role in marketing and leasing has a direct impact on the value of an office building, and knowledge of office building characteristics and economic factors is critical for an effective plan. As a property manager, you must be able to identify office building characteristics and economic factors that contribute to an effective market analysis. 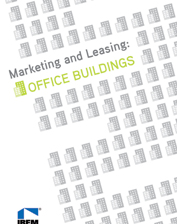 Marketing and Leasing: Office Buildings provides information property managers need to successfully face the challenges of attracting and retaining office building tenants. Gaining knowledge of retail property characteristics and economic factors is necessary for the development of an effective marketing and leasing plan. As a property manager, you must be able to identify shopping center characteristics and the typical duties of the management and leasing staff. 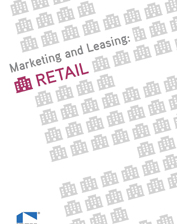 Marketing and Leasing: Retail provides information on effective marketing and leasing tactics specific to retail properties that help achieve the right balance of retailers, increase retail traffic, and greater sales per square foot. Click here for Ch. 19 Length of Stay. 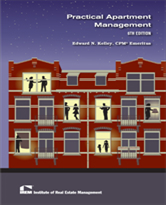 This sixth edition of Ed Kelley’s popular best-seller is a practical guide to what’s new in apartment management. The text has been completely revised to reflect the extensive changes that have occurred in the apartment industry over the past five years. Mr. Kelley has been a forerunner in the apartment management industry for many years, and he continues to pioneer new techniques and approaches for the benefit of property owners and managers everywhere. His how-to, hands-on guide covers the basics of ownership, management, and insurance, as well as advanced solutions for marketing, leasing, and tracking residents of rental properties. Practical Apartment Management is a time-tested, comprehensive guide to apartment management written by a recognized expert in the field. This edition is a must-read for everyone who manages apartments. 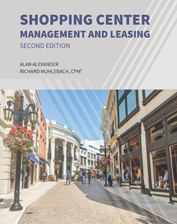 Shopping Center Management and Leasing, Second Edition is a comprehensive guide for managing, marketing, and leasing all types of retail properties—from street retail to multi-anchored strip shopping centers and regional to super-regional malls. This book examines how shopping centers and malls have evolved over time and how this evolution has changed the many roles and responsibilities of the shopping center manager along with the leadership qualities required to carry out the daily duties of the job. 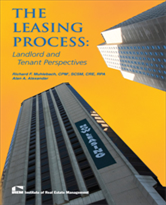 The Leasing Process: Landlord and Tenant Perspectives is a must-read publication for property managers, leasing agents, developers, investors, and tenants alike. It will improve the leasing process and negotiation outcomes for those involved in lease negotiations on any level. This course reviews the key components of effective and profitable marketing and leasing activities. When managing multifamily properties, you need a broad range of skills to manage your property operations successfully from both a short- and long-term perspective. Managing People & Marketing/Multifamily Track, the first of a two-part series, addresses leading your property management team to enhance performance and marketing and leasing concepts that will help your properties thrive in today’s competitive real estate market. This track is the first of a two-part series, addresses leading your property management team to enhance performance and marketing and leasing concepts that will help your properties thrive in today’s competitive real estate market. When managing office buildings, you need a broad range of skills to manage your property operations successfully from both a short- and long-term perspective. Managing People & Marketing/Office Track, the first of a two-part series, addresses leading your property management team to enhance performance and marketing and leasing concepts that will help your properties thrive in today’s competitive real estate market.